What is happening in the ocean? Why is the ocean important? After all, we live on land. But our world is a water world. The ocean covers 70% of Earth's surface. The average depth of the ocean is about 2.7 miles. In some places, the ocean is deeper than the tallest mountains are high! The ocean contains about 97% of all the water on Earth. The ocean plays a starring role in whatever happens with the environment. One big part of its role is to soak up energy (heat) and distribute it more evenly around the Earth. Another part is to soak up CO2. How does the ocean soak up energy? How can a water balloon teach us about climate change? Watch this video and find out. In the ocean, all creatures depend on the supply of plankton (tiny plants and animals) at the bottom of the food chain. The ocean does an excellent job of absorbing excess heat from the atmosphere. The top few meters of the ocean stores as much heat as Earth's entire atmosphere. So, as the planet warms, it's the ocean that gets most of the extra energy. But if the ocean gets too warm, then the plants and animals that live in it must adapt—or die. Algae and plankton are at the bottom of the food chain. Plankton includes many different kinds of tiny animals, plants, or bacteria that just float and drift in the ocean. Other tiny animals such as krill (sort of like little shrimp) eat the plankton. Fish and even whales and seals feed on the krill. In some parts of the ocean, krill populations have dropped by over 80 percent. Why? Krill like to breed in really cold water near sea ice. What would happen if there were no sea ice? What would happen if there were very little plankton or krill? The whole food web could come unraveled. Coral is another ocean creature in trouble. Coral is a very fragile animal that builds a shell around itself. It lives in harmony with a certain kind of colorful algae. The algae make food using sunlight, a process called photosynthesis. They share the food with the coral, and, in turn, the coral gives the algae a safe and sunny place to live. The two of them get along fine, living in clean, clear, shallow waters where the Sun shines through brightly. Fish love coral too, because there are lots of nooks and crannies for them to hide in. But the algae cannot carry out photosynthesis in water that is too warm. The algae either die, or the coral spits it out. Scientists are not sure exactly what happens, but it's bad for the algae, the coral, and the fish. The corals lose their colorful food sources and become weak. This sad event is called coral bleaching, and it is happening on a grand scale in many places around the world. How does the ocean soak up CO2? The ocean absorbs carbon dioxide from the atmosphere wherever air meets water. Wind causes waves and turbulence, giving more opportunity for the water to absorb the carbon dioxide. Fish and other animals in the ocean breathe oxygen and give off carbon dioxide (CO2), just like land animals. Ocean plants take in the carbon dioxide and give off oxygen, just like land plants. The ocean is great at sucking up CO2 from the air. It absorbs about one-quarter of the CO2 that we humans create when we burn fossil fuels (oil, coal, and natural gas.) If not for the ocean, we'd be in even worse trouble with too much CO2. However, the ocean and everything in it are paying a price. The ocean is becoming more acidic. What does this mean? Liquids are either acid or alkaline. Each liquid falls somewhere along a scale with acid at one end and alkaline at the other. Normally, ocean water is less acidic than fresh water. Unfortunately, as the ocean absorbs more and more carbon dioxide from the atmosphere, it becomes more acidic. Lemon juice is an example of an acidic liquid. Toothpaste is alkaline. The ocean is slightly alkaline. However, when the ocean absorbs a lot of CO2, the water becomes more acidic. The alkalinity of the ocean is very important in maintaining a delicate balance needed for animals--like the mussels in this picture—to make protective shells. If the water is too acidic, the animals may not be able to make strong shells. Corals could also be affected, since their skeletons are made of the same shell-like material. One way the ocean affects the climate in places like Europe is by carrying heat to the north in the Atlantic Ocean. Way up north, cold water in the North Atlantic ocean sinks very deep and spreads out all around the world. The sinking water is replaced by warm water near the surface that moves to the north. Scientists call this the Great Ocean Conveyor Belt. The heat carried north helps keep the Atlantic ocean warmer in the winter time, which warms the nearby countries as well. NASA missions that very accurately measure the hills and valleys in the ocean and changes in sea level help scientists understand what is happened with ocean currents. 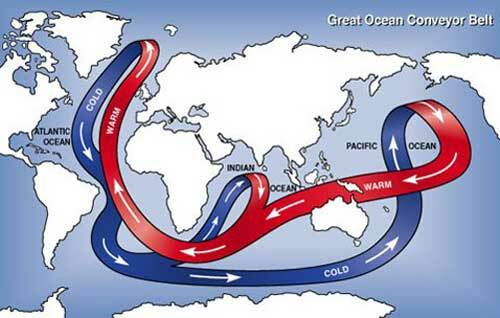 The "great ocean conveyor belt" refers to the major ocean currents that move warm water from the equator to the poles and cold water from the poles back toward the equator. Does the salt in the ocean do anything? Fresh water has lower salinity (saltiness) than estuary water, where the ocean water mixes with river water. The ocean itself is most salty of all. The amount of salt in the ocean water also affects currents. Saltier water is heavier than less salty water. When salty ocean water freezes, the ice can no longer hold on to the salt. Instead, the salt mixes with the water below making it saltier and heavier. Glaciers, land ice and icebergs are made of fresh water, so what happens when this ice melts? Good question! The Great Ocean Conveyor Belt carries warmer, less salty water from the equator to the poles, and colder, saltier water from the poles back toward the equator. 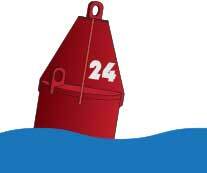 Colder water and very salty water are heavier than warmer water and less salty water. The water in the North Atlantic sinks because it's cold, but also because it's salty. Being both cold AND salty makes it really heavy, so it can sink very far. But if too much ice melts in the North Atlantic, the water could become less salty. If that happens, what about the Ocean Conveyor Belt? Would it stop warming the North Atlantic? Could Europe get really cold? Scientists say it seems unlikely, but NASA satellites are keeping a close eye on the melting ice and the ocean currents to try to understand this complicated system better. What does global climate change mean? What is the big deal with carbon? What is happening to the oceans? What else do we need to find out?